Today only Woot.com is offering this Elenco Snap Circuits 3D Illumination Set for just $34.99 (Reg. $64.99)! Shipping is FREE for Amazon Prime Members or only $5 flat rate. Snap Circuit 3D Illumination will drive you up the wall, literally. With snap modules you will be able to go vertical with your circuit building by securing your snap boards together in a myriad of configurations. The snap modules include the vertical snap wire, base grid stabilizer, base grid support and using them will create a stable platform as your erect each of the 150+ 3D illumination snap circuit projects included in this kit. Taking snap circuits to a whole new dimension up, out and over! 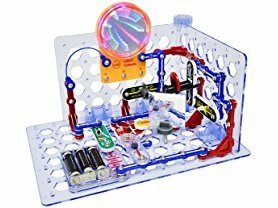 Build over 150 projects or combine with other snap circuits sets to build even more unique structures. New features and new snap modules created just for this kit include: exciting light effects - 3-color light tunnel - projector with 6 cool images - mirrors and reflecting circuits. Comes with over 50 parts. New parts like the vertical snap wire, base grid stabilizer, base grid support give you the tools to build amazing 3D structures!